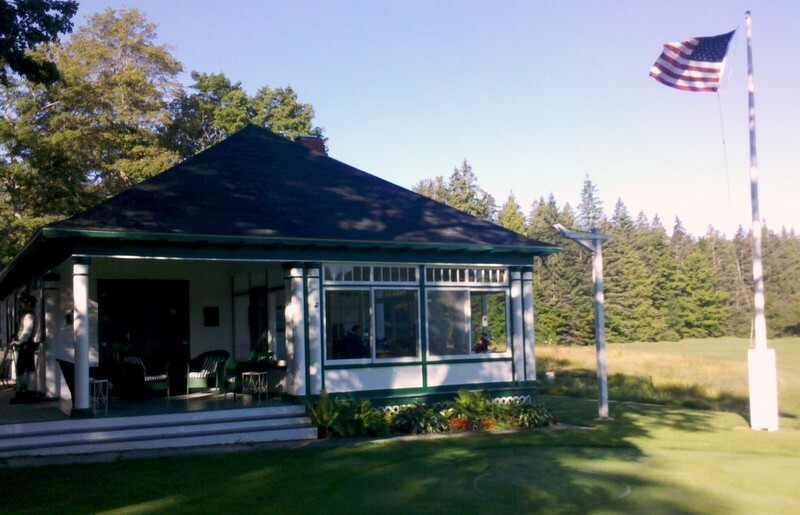 Jim Doherty, a reader in Chicago, wrote to me toward the end of the summer about a family vacation he had taken to Mackinac Island, Michigan—which is in Lake Huron all the way up next to Canada. (Mackinac, incidentally, is pronounced Mackinaw.) Jim is one of the guys in the photo above; the other is his brother-in-law, Mike. 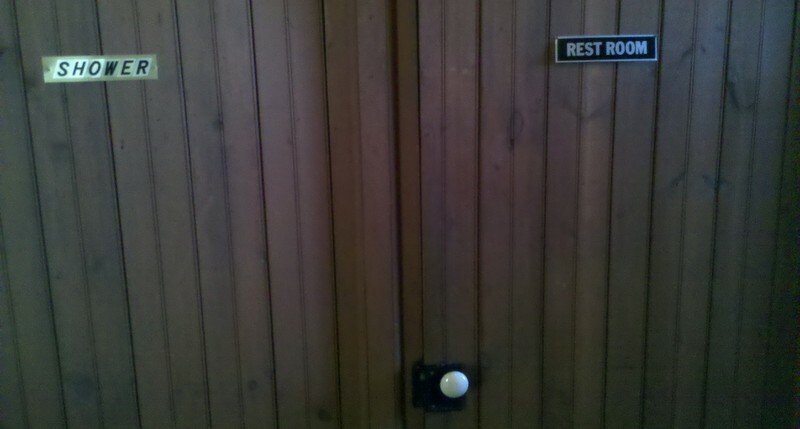 Because male golfers are essentially interchangeable, it doesn’t matter which is which. Here’s what the island looks like from the air. 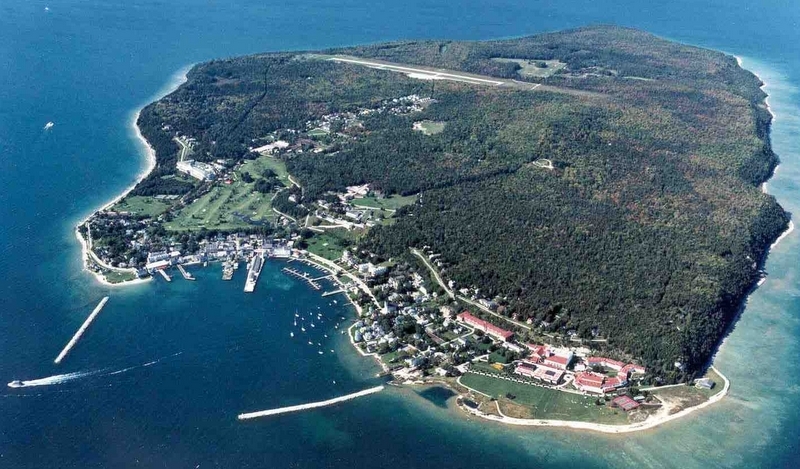 Mackinac Island doesn’t allow any motorized vehicles. You ferry over with bikes, and there are horses and carriages that you can use to get around as well. The island had some military importance way back in 1812 and is now a beautiful spot to visit. There are a lot of fudge shops, for some reason. Anyway, even though our wives had chosen this non-golf-hotspot for our vacation, Mike and I brought our sticks on the theory that at some point our families would be equally sick of us (seven-hour drive) and be happy to see us exit to a golf course for a while. Remember, there are no motorized vehicles, so we rode our bikes, with our bags on our backs, up to the course. The inclines early in the ride were steep enough that we needed to walk the bikes, but it was worth it. Wawashkamo is a gem. No irrigation in the fairways or rough. Fescue-lined holes. Tiny hand-mowed greens in great shape, and tees that are literally about twenty square feet. I guarantee that the area rug under your dining-room table is bigger. Wawashkamo has two sets of tees, which change the length and angle of the holes a bit. It’s an easy walk: ninety minutes, max, for nine holes, then back on the bikes for the downhill ride to our families. The club’s pro, Chuck Olson, invited us to leave our clubs overnight and return to play the next morning, to ease our bike ride. We got the idea, from talking to him and a member, that the club’s budget is nil. Wawashkamo is closed for the season (I’m pretty sure, based on the website), but it will be open again in early May. Fifty dollars for eighteen holes, walking. Let’s go! 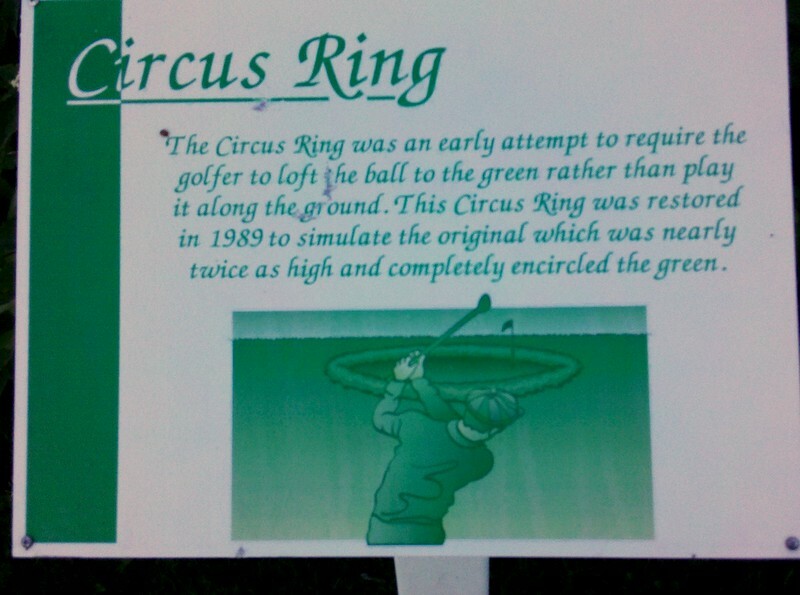 This entry was posted in Architects, Buddies Trips, Golf Courses and tagged Carnoustie, Circus Ring, Frank Dufina, Grand Hotel, Mackinac Island, Wawashkamo, Western Open by David Owen. Bookmark the permalink.